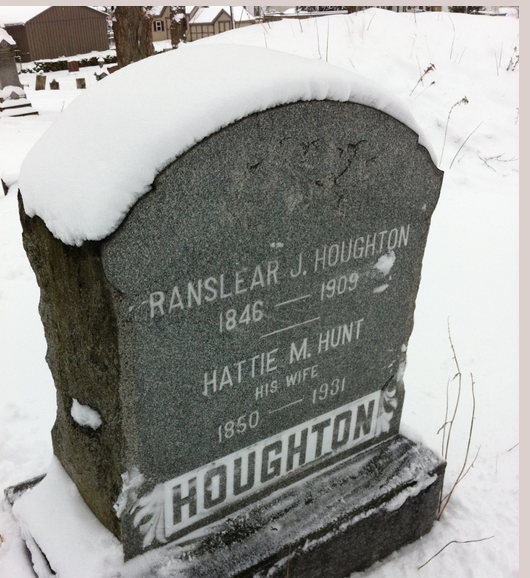 Ranslaer James Houghton married Harriett Hunt in Sep 23, 1868 mar 32 years in 1900 census. Warren Ira Houghton married Evelyn Smiley in 1934. Russell Charles Houghton married Ellen A. Hand in Sep 1, 1926 at First Methodist Church. Russell Charles Houghton and Ellen A. Hand were divorced in Jul, 1941 at Sidney, NY, USA. Russell Charles Houghton married Muriel Bowman in Apr 28, 1945 at Dolgeville, NY, USA, at the bride's home. Harley Monroe Houghton married Eugena Fallon in Nov 25, 1942 at Maryland, NY, USA, at the home of Mr. and Mrs. Clarence Blake of Maryland, NY. Walter Arnold Houghton married Leona Davis in circa 1906. Dora Louise Houghton married Richard Sewell h/1. Eva Belle Houghton married Burton J. Palmer in Nov 11, 1914 h/1. Eva Belle Houghton married Charles Markle h/2. Minnie Anne Houghton married Adelbert F. Cook in Feb 20, 1900 h/1. Adelbert F. Cook married Minnie Anne Houghton, daughter of George Edward Houghton and Mary Johanna Dunham, in Feb 20, 1900 h/1. Edward J. Cook married Emma Groves. Mildred E. Cook married Horace Edward DeVine h/1. Irene Eugenia Cook married John Henry Miller in Jan 19, 1928. Emma Groves married Edward J. Cook, son of Adelbert F. Cook and Minnie Anne Houghton. Hazel (?) married Orville W. Cook, son of Adelbert F. Cook and Minnie Anne Houghton. Horace Edward DeVine married Mildred E. Cook, daughter of Adelbert F. Cook and Minnie Anne Houghton, h/1. Richard Douglas DeVine married Christine Saller. Richard Douglas DeVine and Christine Saller were divorced. Richard Douglas DeVine married Marilou Burton w/2. Patricia Devine married Edward Paul Tollerton. Floyd Teel married Minnie Anne Houghton, daughter of George Edward Houghton and Mary Johanna Dunham, h/2. L. Ulrich Baldauf married Minnie Anne Houghton, daughter of George Edward Houghton and Mary Johanna Dunham, in 1957 h/3. John Henry Miller married Irene Eugenia Cook, daughter of Adelbert F. Cook and Minnie Anne Houghton, in Jan 19, 1928. Kathryn Ann Miller married William Stacknow.